The folks at FiveThirtyEight had a fun data visualization discussion during their regular election chat this week, about whether Hillary Clinton should focus on ensuring victory next month or spending more money in “red” states to expand her Electoral College map. Nate Silver chimes in by alluding to the classic discussion about how choropleth maps of the United States in a political context can distort a story. That’s because geographically large but sparsely populated western states skew the picture. harry: People look to the map to understand how big the victory was. We have a winner-take-all system. micah: Yeah, if the map everyone sees on Nov. 9 is covered in blue, doesn’t that make a difference? clare.malone: I think it’s a reasonable goal for them to want to/try to win at least one unexpected state. A spot of blue in a sea of red can be a striking visual that people walk away with. natesilver: So should they aim for states that are physically larger because they’re more impressive on the map? natesilver: Or not Alaska because it gets shrunken down? harry: Is this a Mercator problem? I don’t know maps. Despite her big win in New York, trouble looms for Hillary Clinton in the general election, according to a new poll that shows her favorable/unfavorable ratings at dangerously low levels among key demographic groups. Clinton has seen her fair share of bad polls over the years, yet she’s found ways to rebound. The same can’t really be said about her first name, however. Perhaps one measure of her favorability — if so, a cruel one — is the frequency with which American parents have decided to call their daughters “Hillary”. The name peaked historically the year her husband, Bill Clinton, won the White House. It then plummeted dramatically, according to Social Security card application data released by the federal government. 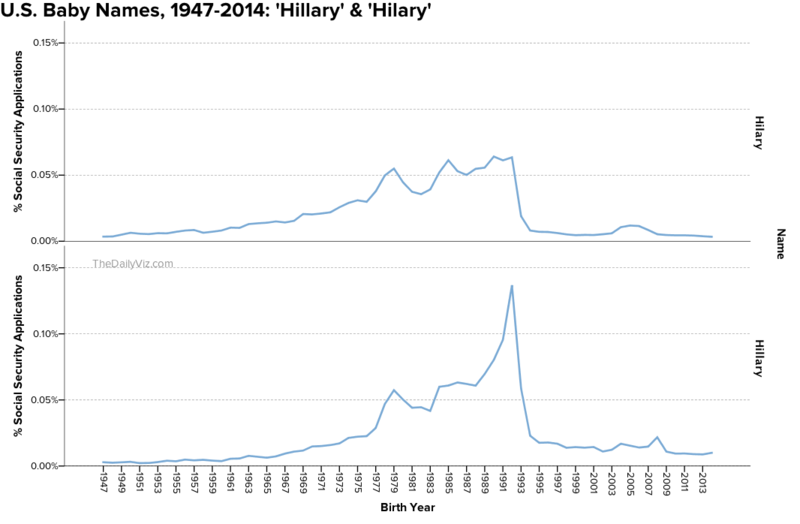 “Hillary” was most popular in 1992, when about 2,500 girls received the name — roughly .14 percent of those listed in the data that year. Two years later, only about 400 girls received the name, or about .02 percent. (“Hillary”, by the way, made a small but brief comeback in 2008). The figures in both years seem low, given the size of the country. But remember that Americans get creative with their kids’ names. There were about 1.84 million girls who received Social Security cards in 1992, and their parents picked at least 15,000 different name iterations, from Aaisha to Zykeia. Ashley was most popular with about 38,000 applications (or roughly 2 percent of the listed names). Perhaps Hillary would be slightly more popular if parents conformed (or could spell). In 1992, for example, a few hundred poor souls got these iterations of Clinton’s name: Hilliary, Hillery, Hillari, Hillarie and Hillaree. Also: Hilary. My name — Matthew — has taken a roller coaster ride, too. It peaked in 1983, with about 50,000 boys receiving it — roughly 2.8 percent of the 1.8 million boys who received Social Security cards with that birth year. What caused the name’s rise? Perhaps I’ll never know, though my mother picked it not from the New Testament but from a John Denver song. Thanks, Mom. (At least you spelled it correctly). Want to see your name? Tell me in the comments. This post has been updated. See correction at the bottom of the page. To some Bernie Sanders supporters, the Democratic presidential race must seem close. Their candidate, after all, has essentially split victories with Hillary Clinton in the more than 30 election primaries and caucuses since the process began in February — including several in a row recently. Clinton, their thinking goes, may have a lead in pledged delegates for the nomination, but her sizable and (for now) critical lead among party leaders known as “superdelegates” could crumble if the Vermont senator continues winning. Anything’s possible. But Clinton has already secured many, many more votes than the Vermont senator and, party rules and delegate grappling aside, is absolutely dominating the race in terms of raw support. 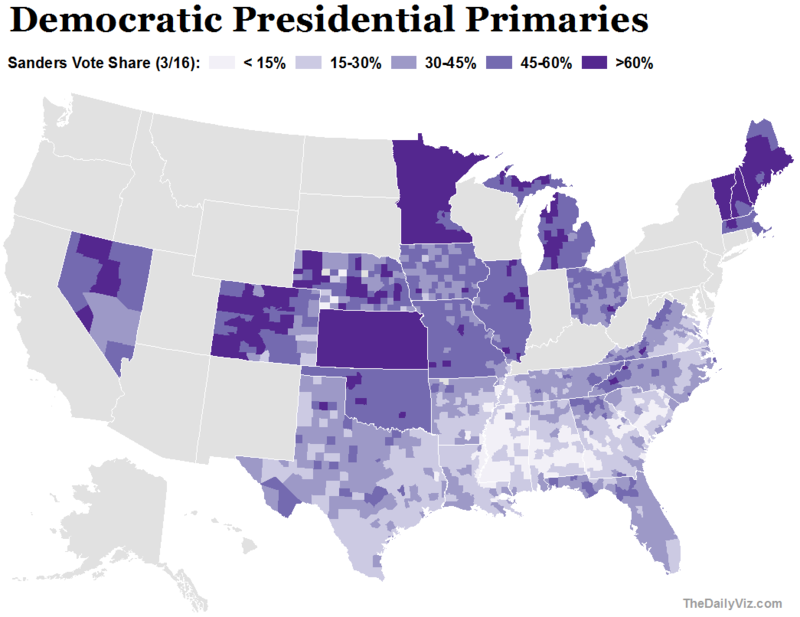 This trend is likely to continue with large, Clinton-friendly states coming up, and it could undercut Sanders supporters’ “will of the voters” hypothesis going forward. 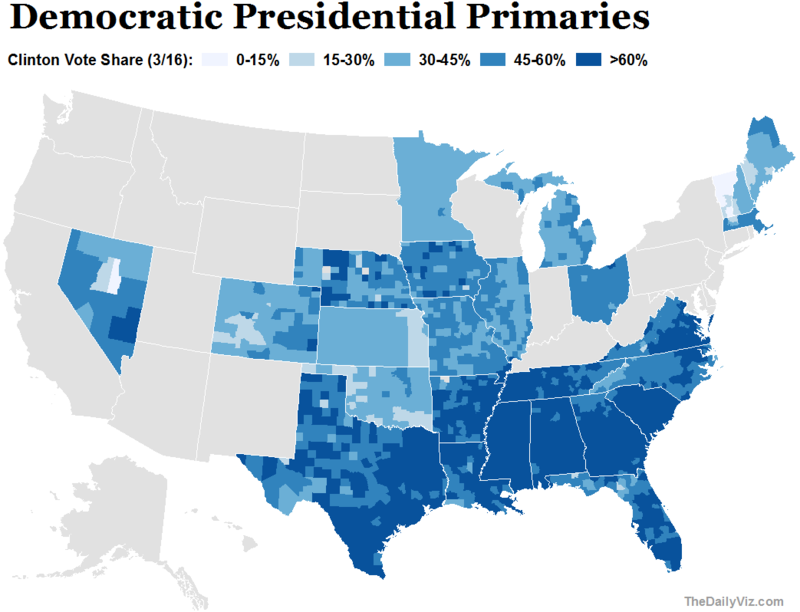 Clinton has won roughly 9.4 million votes, compared to Sanders’ 7 million, according to returns from U.S. states. Along the way she’s posted huge victories. Her margin in Florida alone (530,000 votes) is about the same as Sanders’ margin in his victories combined. The charts were made with Tableau Public, a useful tool for sketching with data. You can see interactive versions of the charts here: Scatter | Bubbles | Maps | Time. Last week we examined how the Democratic presidential campaigns have performed in the context of Barack Obama’s 2012 re-election. 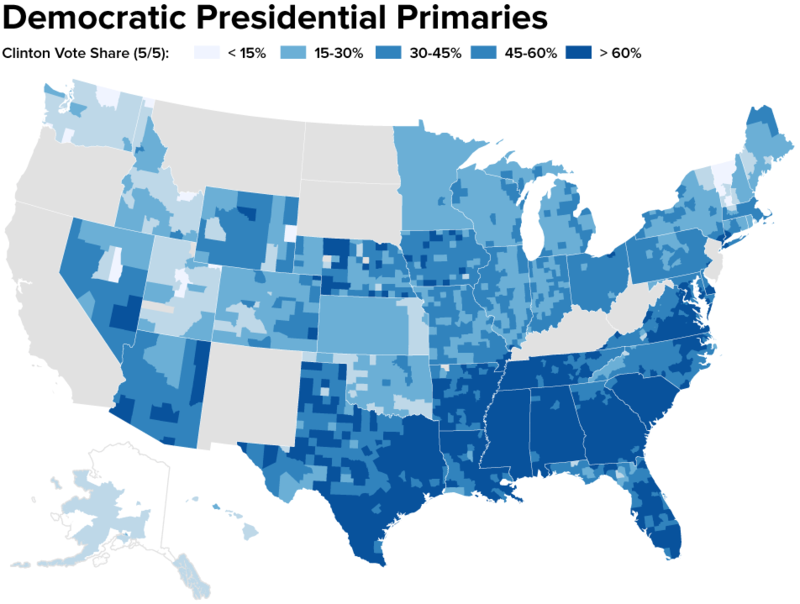 That analysis grouped Obama’s vote share into categories, highlighting how the country’s reddest and bluest counties have voted for Hillary Clinton and Bernie Sanders so far in the Democratic primaries. 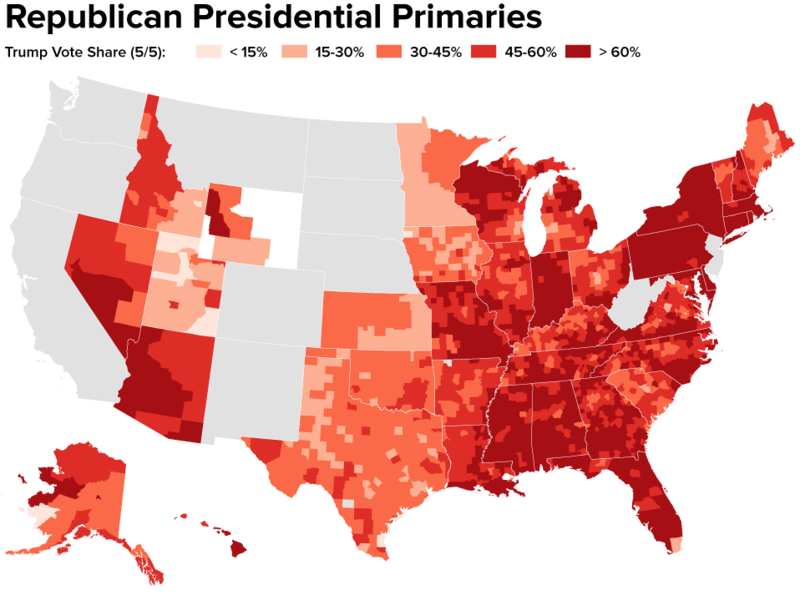 Clinton, the clear frontrunner, performed best in areas where Obama was strongest against Mitt Romney. But Sanders did slightly better when majority black counties weren’t factored.